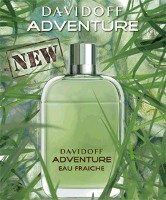 Davidoff will launch Adventure Eau Fraîche (above left), a new flanker to 2008's Adventure for men, in February. The fresh green fragrance features notes of green mandarin, bergamot, neroli, ginger, basil, cedar, vetiver and musk. The rock style is one of the biggest trends for Autumn-Winter 2009/2010. You’ve already had some clues and suggestions for creating the look, but there’s still one little detail missing: the perfume. Lady Rebel, the new fragrance by MANGO, is the ideal accessory to this style inspired by rock stars. It’s elegant, feminine and sophisticated, but also provocative, passionate and vibrant. It’s full of contradictions! Lady Rebel is a fruity floral with notes of mojito, strawberry, pineapple, wood, rose petals, vanilla sugar and patchouli. Good Lord! Strawberry, pineapple, mojito, and vanilla sugar? All in the same fragrance? If this isn’t the least appealing thing I’ve heard of all year, I don’t know what is. Pardon the crankyness but this sounds like a hot mess. I think this is geared towards about the same audience as Vera Wang Rock Princess (in other words, young). No doubt, Robin. However, anyone older than 12 might get a cavity from just reading about it. God, that sounds awful. Those might be the worst fragrance notes I’ve seen in a while. Mash up between Ma Dame, Vera Wang Rock Princess + Anna Sui Rock Me. “Mango Lady Rebel”? Name more meaningless? i love how fresh frags for men get Eau Fraiche versions. it can never be fresh enough!!! the original Adventure is a woody scent. I dont find it to be fresh. Lets face it, flankers are not really different versions of the same scent anyway, they are just different versions of the same name. I didn’t try the original so can’t say, but I think that’s right, it was classified as a spicy woods or something. Comes in handy, I’m sure. Lady Rebels sounds very very sweet. Something for very young girls. The advertising looks like a mix between Ma Dame Gaultier and Anna Sui Rock Me. What’s next? Banana Man Rebel? Oh, I hope so! Great name. Is that pronounced ree-bell or reb-bell? What notes like that, I guess it’s irrelevant. Oops!….With notes like that. Sorry. Nothing says “lady” or “rebel” like strawberry, pineapple, and vanilla sugar.